This blog post was originally published on the SOARWorks website on October 31, 2017. So much of the work we do at Policy Research focuses on disability, and within the SAMHSA SOAR Technical Assistance (TA) Center this work often focuses specifically on the link between disability and employment. The SOAR program aims to help people access benefits and achieve recovery so they can ultimately return to work. Another Policy Research project, The Analyzing Relationships between Disability, Rehabilitation and Work (ARDRAW) Small Grant Program, funds the research projects of graduate students who are analyzing the connection between disability and work. Despite this focus, it is all too easy to get caught up in the details of our work and lose sight of our purpose. At the SAMHSA SOAR TA Center we spend hours poring over mock disability applications from trainees who will soon be in the field connecting with people experiencing homelessness and getting them on the road to recovery and, hopefully, work. Application reviews, planning site-based TA, and conducting TA over the phone make for some very busy work days. Our task lists are very pointed, and we are constantly moving on to the next thing. Since most of us are not in the field, we rarely have the chance to see firsthand how our work might directly effectuate people. I recently had the privilege of seeing this work come full circle and was able to experience the satisfaction of seeing an employment opportunity presented to someone who might otherwise not be able to work. Michelle, whose name has been changed to protect her privacy, came to PRA through the work program at Warren, Washington & Albany Arc(WWAARC). She is a recipient of SSI (Supplemental Security Income), the very program the SOAR team helps people gain access to every day. As part of her pre-employment training, Michelle was required to fulfill a certain number of “on the job” hours. Michelle not only has intellectual disabilities, but physical disabilities that significantly limit her mobility. Because of this, Michelle’s job coach and I had to figure out what kinds of tasks would best fit her skill set and what physical accommodations she would need to be successful. Twice a week for several months, Michelle arrived at PRA with a smile, ready to jump right in. Her time was spent preparing materials for upcoming TA visits, including collating papers and stuffing folders. She was always asking questions, and became increasingly invested in the quality of her work. She quickly made a home for herself at the SAMHSA SOAR TA Center. The gifts that she brought to PRA, such as her enthusiasm, friendliness, and satisfaction in a job well done are all lessons that we can learn from her. Her shining personality and professionalism were a humbling reminder of how attitude is everything. We should all strive to approach our day and those around us in this manner. 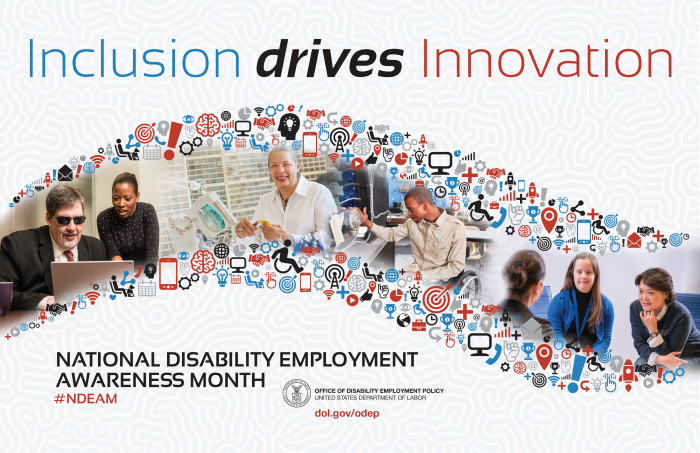 All of this coincided with National Disability Employment Awareness Month, a time when employers are asked to celebrate people with disabilities within their organizations and the contributions they make. The theme for this year is “Inclusion Drives Innovation.” It’s easy to focus on the benefits that this experience gives to people like Michelle, and to make this the driving force for inclusion. PRA is giving her an opportunity to develop skills and an opportunity to make herself more employable, a goal she is working towards achieving. But what about the benefits to PRA and other companies that make an effort to employ people with disabilities? This experience reminded us of the value that collaboration brings to our workplace culture. It forces us to be creative and flexible at the same time. It gives us a chance to reevaluate how we can create more opportunities for people like Michelle. Tailoring specific tasks so they are achievable for a person with disabilities takes time, but it is a worthwhile effort. PRA is committed to continuing this relationship with WWAARC and we look forward to creating another opportunity for someone else. While Michelle has moved on, I’m reminded of how proud I am to be part of a workplace that helped create a pathway towards success for her!